In his blog Productivity, Performance, Fitness, and a work/life balance, Jason Womack posted today about visualizing one's goals and ambitions in life, and keeping the vision alive and burning by writing it down. In Jason's case, it was the goal 8 months ago of completing the Ride the Rockies bicycle ride. Many of us have heard the legendary story of actor Jim Carey writing himself a $10 million check representing what he hoped to earn from acting one day. Well, Jim's dream came true in spades. And, Jason's goal of finishing the ride was realized on June 23rd, as planned. Jason's entry made me think of my childhood dream of climbing Everest. When I was an 8 year old boy growing up in the mountaineering heartland of Topsfield, Massachusetts - there are no mountains there at all! - I set a goal for myself of one day climbing Everest. This dream was reinforced when I met Lou Whittaker in 1984 upon his return from leading the first American expedition to climb the North Side of Everest. Many people just laughed when I told them my goal in life. Afterall, I was a little kid with no climbing experience, no mountains around, and no one to teach me how to climb. How on earth was I ever going to get to Everest? 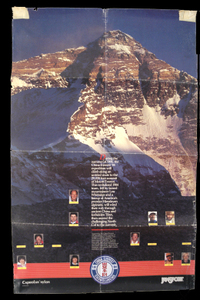 After meeting him, Lou gave me a poster of Everest's North Face. I hung it above my bed. Every night as I went to sleep, I stared at its massive features, memorizing the cliffbands, couloirs, and cornices and dreaming of one day being there. It took years of effort, of trial and error, success and failure on many peaks around the world. But, finally, when I was twenty-five years old - after seventeen years of dreaming about it - I finally stood at the base of Mount Everest, staring up at the great North Face. As corny as it may seem at times, I truly believe that what we put in front of ourselves, what we write down, hang above our desks, and have as a visual reminder day in and day out...Well, those things have a way of becoming reality. Jim Carey knows it, too. What is your dream, goal, or vision for your future? Write it down, hang it above your desk, on your bathroom mirror, or above your bed. Keep the dream alive...You never know what heights you can scale. Very nice post! Every once in awhile we need to be reminded to keep our eyes on the prize. After all, the best dreams are the ones that are the hardest to attain. "I think I can...I think I can...I KNOW I can!" Jake, thanks for referencing this post. When I wrote it, from my Treo handheld, and e-mailed it to my blog, I felt that it held a lot of my philosophy and methodology in one short(er) entry. Where I sit at my desk, I have another "picture of a goal" up in front of me - it's at eye level, so that each time I look up I am reminded of what I said I wanted. When I see it, I go through a short(er) visualization process of what it will be like to experience what that goal means. So, between now and then, I'll trust in the process and of course let people know about the journey on my weblog!